A study of 84 twin/sibling pairs exposed to alcohol in utero indicates there’s no safe limit of alcohol exposure for pregnant mothers. Risk of damage is not solely dependent on how much alcohol is consumed during pregnancy; fetal genetics plays a vital role, a new study suggests. A study of 84 twin/sibling pairs exposed to alcohol in utero shows that two fetuses exposed to identical levels of alcohol can experience strikingly different levels of neurological damage. Risk of damage does not depend solely on the pregnant woman's alcohol consumption; rather, fetal genetics plays a vital role, according to findings published today in the journal Advances in Pediatric Research. From a public-health standpoint, she said, the biggest take-away is that a fetus' genetic makeup is a determinant to the risk of neurological damage from a mother's alcohol consumption. To protect all fetuses, including those most genetically vulnerable, the only safe amount of alcohol is none at all, the report concludes. In the study, UW Medicine researchers with the Fetal Alcohol Syndrome Diagnostic & Prevention Network analyzed data that had been gathered over more than 26 years. They found that when twins with identical DNA experienced identical alcohol exposure, the fetal alcohol outcomes were identical. 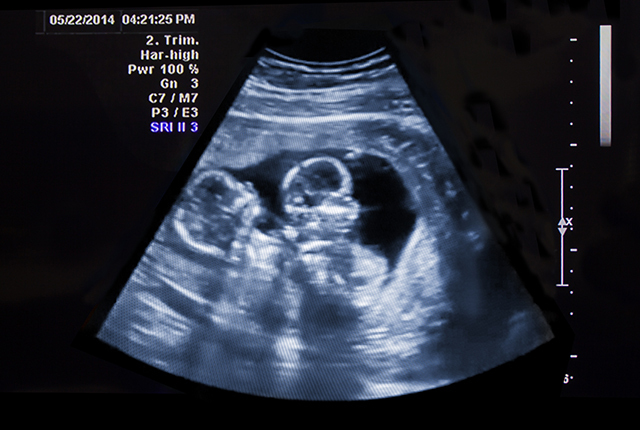 In contrast, among genetically non-identical twin pairs with identical alcohol exposures, their fetal alcohol outcomes often differed, sometimes strikingly: one could be born with severe fetal alcohol syndrome (FAS) and the other only mildly affected. This study, the largest of its kind, comes as some clinicians and researchers continue to advocate that light drinking, generally defined as one alcoholic drink per day, is OK for pregnant women. Astley Hemingway has argued against that point of view for years. Even one drink a day can place some fetuses at significant risk, she wrote in an opinion-editorial last fall. One of every 14 children diagnosed with fetal alcohol syndrome at UW Medicine had a reported exposure of one drink per day. The research team combed through the records of 3,000 individuals with prenatal alcohol exposure evaluated at the clinic since it opened in January 1993. Of those cases, the team gleaned 84 pairs of identical twins, fraternal twins, full siblings and half siblings. Only sibling pairs with the same prenatal alcohol exposure who were raised together and diagnosed at the same age, by the same team, using the same diagnostic system were included in the study to minimize other factors that might influence their developmental outcomes. Of the 84 pairs, there were nine identical twins, 39 fraternal twin pairs, 27 full sibling pairs and 9 half-sibling pairs. Genetic relatedness – the amount of DNA shared between sibling pairs –is 100 percent between identical twins-pairs, 50 percent between fraternal twin pairs, 50 percent between full-sibling pairs and 25 percent between half-sibling pairs that share a common birth mother. As genetic relatedness decreased across the four groups, the proportion of sibling pairs with different fetal alcohol outcomes increased from zero to 44 percent to 59 percent to 78 percent, respectively. UW co-authors were Julia Bledsoe, professor of pediatrics; Julian Davies, professor of pediatrics; Allison Brooks, researcher in epidemiology; Tracy Jirikowic, associate professor of rehabilitation medicine; Erin Olson, teaching associate, College of Education; and John Thorne, senior lecturer, speech and hearing sciences.